1 HEAT 1 Tbsp. (15 mL). of the butter in a large nonstick skillet over medium-high heat and cook your shrimp 3 minutes or until they turn pink. Add your tomatoes and cook 1 more minute. REMOVE everything from skillet and set aside. 2 ADD remaining butter to the same skillet and now cook your green beans over medium heat 5 minutes. Add water to the green beans and bring to a boil; then stir in contents of Knorr® One Skillet Meals and return to a simmer. Cover, remove from heat and let stand 5 minutes to allow water to absorb and couscous to become tender. 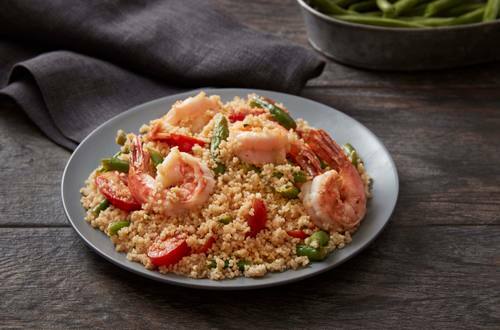 3 FLUFF your couscous with a fork, then stir in your reserved shrimp and tomatoes. Now it's delicious, dig in!